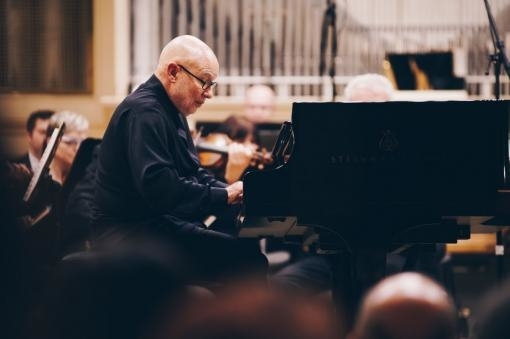 Yesterday in Besední dům classical music lovers had their very first chance to hear the new chief conductor of the Brno Philharmonic Dennis Russell Davies also in the role of piano soloist. Under Davies’ baton there was a performance of the Symphony in D major, Op. 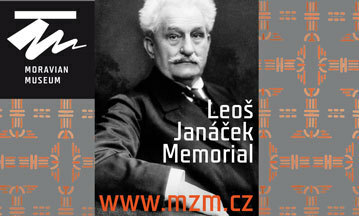 23 by the Vamberk native Jan Václav Hugo Voříšek and the premiere of the orchestral arrangement of the chamber work by Antonín Dvořák Bagatelles, Op. 47 created by the chief conductor himself. Davies took his place at the piano to play the Piano Concerto No. 24 in C minor by Wolfgang Amadeus Mozart. The chief conductor will also be performing as soloist in two upcoming recitals, playing for example works by Steve Reich, John Adams and Philip Glass. While the programmes for Davies’ much anticipated concerts is mostly made up of music from the 20th century, works of a more classical nature were selected to introduce the interpretive art of the new chief conductor. The concert opened with the orchestral arrangement of Dvořák’s Bagatelles. Dennis Russell Davies left the majority of the violin parts to the string section and divided the harmonic passages between groups of individual instruments. Personally I see the arrangement of what were originally chamber works as the proverbial skating on thin ice – it can be an exciting experience but there is a constant danger of getting it wrong and starting to sink. The players, led by the conductor have to replace with purely orchestral elements the chamber intimacy and pure intimacy of musical expression. Where there was the unique expression of a solo melodic line, there can be more significant work with the colours of individual instruments. In place of the silence of the chamber hall being broken by the expressive tones of a violin, there can be thunderous passages supported by a brass instruments, timpani and deliberately escalating dynamics. What was missing from Dvořák’s Bagatelles in the arrangement by the chief conductor of the Brno Philharmonic was to be found in abundance in the Symphony in D Major by Jan Václav Hugo Voříšek. Although a work by a relatively young composer, the technical and compositional brilliance with which the composer works with his musical motifs, individual instruments and form, is incredible. Voříšek not only showers the listener with new and unexpected ideas, but does so with an immediate and clear elegance. It was exactly this unforced quality that was also displayed in the performance by the Brno Philharmonic. At the same time we are not talking about a simple work – frequent changes in tempo, rapid figurative runs and impressive dynamic changes occurring in abundance in each of the movements. Voříšek in addition dedicated unusual care to orchestral groups, from which soloists emerge here and there with short interludes. Although the level of the solo parts was not entirely consistent for all performers, the overall result was a success with only minor intonation flaws. Mozart’s Piano Concerto No. 24 in C minor somewhat unfortunately concluded the concert. Although this piece was supposed to be performed before the intermission, for understandable technical reasons it was only heard at the end. This was a pity, since after the aggressive and energetic as too great a change. Mozart’s Piano Concerto is often interpreted with romantic overlap and it was no different yesterday. The soft and dreamy start to Davies’ part went hand in hand with the unnecessarily moderate dynamics of the orchestra – and this did not fundamentally change even in the stormier parts. Davies’ piano playing was cultivated and at a high technical level. Despite this the resulting performance – given the quite significant pedalling and frequent rubato – in places was more reminiscent of a work by Chopin than Mozart. We should not overlook the successful cadenzas by Balduin Sulzer and Philip Glass, who wrote his cadenza for Rudolf Firkušný although it is not known whether he ever played it, and the second cadenza was personal request from Dennis Russell Davies from the catholic priest and composer Balduin Sulzer. Sulzer’s cadenza in particular was, given its modern compositional language, an unexpected musical novelty, which furthermore gave us an insight into Davies’ understanding of contemporary piano works. The orchestra produced a quality sound but even in this case it has to be said that more dramatic and expressively colourful works would suit the musician much better. The first concert with the chief conductor at the piano offered traditional musical works, while bringing several musical premieres. The first of these was the performance of a new orchestral arrangement of Dvořák’s composition Bagatelles, the second and at first glance less obviously a premiere, was the piano cadenza in the Mozart concerto. Already in the first concert with chief conductor at the keyboard he managed to weave into an otherwise traditional work an thread of novelty. However the unfortunate order of the works and the unusually flat dynamics were unfortunate.